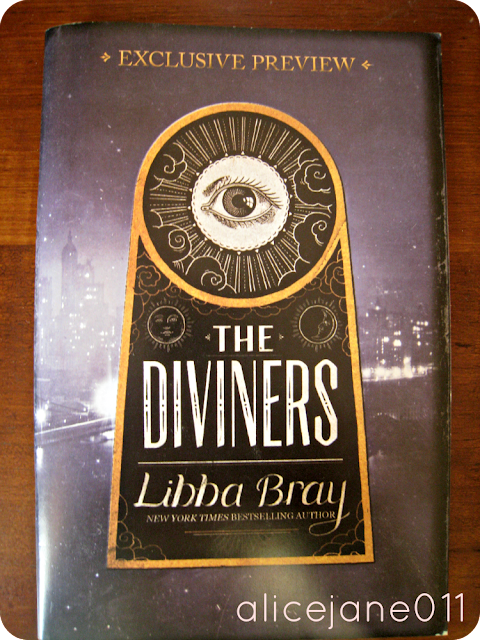 A month ago, I received a sampler for Libba Bray’s latest book, The Diviners, in the mail. I loved Libba Bray’s Gemma Doyle trilogy (it was the series that made her famous) and I loved the chance to read her latest book, even only a part of it, early. I opened the sampler with the expectations of an introspective and flowing writing, similar to that of The Great and Terrible Beauty, but I got something different. Unlike the Gemma Doyle trilogy, The Diviners is told through third-person narration. It’s different, but still has the distinct writing style of Libba Bray. (First lines: In the town house at a fashionable address on Manhattan’s Upper East Side, every lamp blazes. There’s a part going on-the last of the summer. Out on the terrace overlooking Manhattan’s incandescent skyline, the orchestra takes a much-needed break.”) As usual, Libba Bray captures the tone and voice of a distinct time period. For the Gemma Doyle trilogy, she captured the atmosphere of turn of the century England, and for The Diviners she captured the 1920’s- complete with speaksies, flappers, Prohibition, everything. The novel reflects the amount of research done on the time period as there is an abundance of 1920’s slang, such as “I am pos-i-tute-ly serious”, “You bet-ski!” “Do you have any hooch?”. As usual, I felt entirely immersed in the setting. 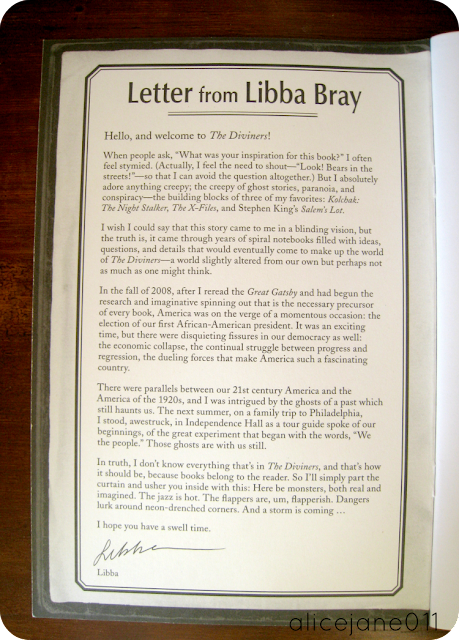 In the letter from Libba Bray (picture below), Libba Bray says that The Diviners was in part influenced by Great Gatsby, another novel about 1920’s- the rich, the poor, and the great divide. I can see touches of it in The Diviners, the carefree style, but then again, that was the time period. Libba Bray names three other books (Kolchak: The Night Stalker, The X- Files, Salem’s Lot (by Stephen King)) but seeing how I haven’t read any of them, I can’t speak about them. 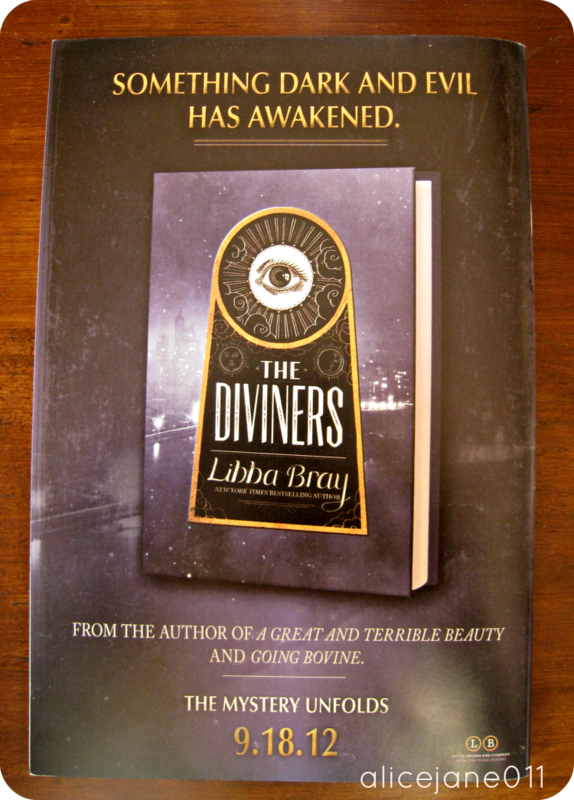 The Diviners comes out tomorrow, September 18th. Have a swell time reading it! Despite the fact that the book hasn’t come out yet, there’s already a movie deal for The Diviners. The movie rights were bought by Paramount and Libba Bray is slated to write the movie adaption and be the executive producer for the adaption. I’m excited as I can be and once you read the book, you’ll understand! I'm loving the fact that it's inspired by the great gatsby because I love that book! Great review! I can't wait to read it!